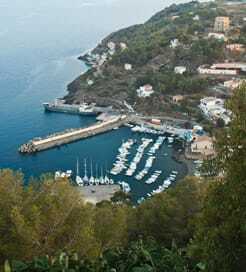 The tiny island of Ustica is the peak of an ancient, submerged volcano in the Tyrrhenian Sea, situated 52km north of Palermo. Known by locals as ‘The Black Pearl’, its hilly landscape consists mainly of black rock formations and the odd speckle of spring flowers or cacti. Ustica is also famously known for its use as an island prison until the 1950s, where Mussolini sent many political opponents during his rule. There is a fascinating museum documenting everything about the penitentiary which is well worth visiting. It boasts excellent scenery for long walks, with the best route taking you up to the island’s fort. Built by the Bourbon kings in the ancient Roman era, this historic landmark stands at 157 metres and offers fantastic views over the island. The coastline itself features a number of spectacular grottoes and, as a marine reserve, perfectly clear water. Some visitors come especially for the superb diving opportunities, with the waters teeming with shipwrecks, Roman artefacts and colourful marine life. If you’re looking for a relaxing evening after a long day of hiking, then the main town provides the perfect setting. The large, picturesque piazza boasts charming restaurants and bars overlooking the sea. There are also a number small food stores selling everything you need for a perfect picnic on the beach. There is a fast crossing from Trapani, Sicily and a slightly longer crossing from the Port of Napoli on Italy’s west coast. Both journeys are operated by Ustica Lines, providing one sailing every week. For more information, please visit our Ferries from Sicily to Ustica Island page. For more information, please visit our Ferries from Italy to Ustica Island page.